I want to add some color to a shady area in my yard, however, I do have deer in the area. Are most coleous a good plant? Coleus does not make the 'deer resistant' list. 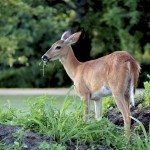 If Deer are hungry, they will eat anything, whether it's deer resistant or not.